KB DAV-7 and Roller Skating run parallel to each other. The Roller Hockey Skating Rink has held many National and International coaching camps. The KB DAV-7 rink has prepared many Roller Hockey Indian Teams to participate in Asian and World Championships. Our students have always shown their mettle in sports and have made outstanding achievements in skating, on both National and International Fronts. Our International skaters Amandeep Singh was declared world’s 4th highest scorer in World Roller Hockey Championship held at Uruguay, South America in September 2006, followed by Rohit Bajaj( 2007), Karan Lamba(2008), Vipin Kumar(2008), Mukul Jain(2008), Bhavdeep Singh(2010) and Mohit Kumar in 2013. Mehak Paul, a National Skater, has been a recipient of President’s Award in the field of skating. Vipin Kumar and Bhavdeep Singh have been felicitated by the U.T. Administration. The Skating Prodigies In Action! Mohit Kumar, the youngest player just 14 years in age, played a key role in Senior Inline Hockey World Championship held at Anne hem, California, USA from 10th July 2013 to 25th July 2013. The International Inline Championship was organized by Federation of International Roller Skating. While playing against Japan in the World Championship, Mohit Kumar, The Master in Defence and Attack in Inline Hockey, gave 3 clean sheets and played a chief role to achieve 2 goals for Indian Inline Hockey Team. At the National level, Mohit Kumar has 30 Gold, 45 Silver and 25 Bronze medals to his credit in various CBSE National Skating Championships, Open National Games organized by RSFI, School State Games organized by Chandigarh Administration or National Skating Championship organized by Roller Hockey Federation of India. The Indian Inline Hockey, Speed and Roller Hockey Team, both for men and women was lead by Principal Madhu Bahl as a Chief-de-mission and Chairperson for Senior Inline Hockey World Championship held at Anne hem, California, USA from 10th July 2013 to 25th July 2013. Amandeep Singh declared World’s Fourth highest scorer in World Roller Hockey Championship held at Uruguay, South America in September 2006. Rohit Bajaj gets 3 Gold medals in 13th Panchkula District Roller Skating Championship organized by Roller Skating Association, Panchkula. Rohit Bajaj bags 1Gold and 1 Silver medal in Rink Race II and Roller Hockey at 21st Sushil Kumar Memorial Haryana State Roller Skating Championship held at Panchkula. Rohit Bajaj bags 1 Gold medal in 45th National Roller Skating Championship held at Vishakhapatnam. Rohit Bajaj bags 2 Gold medals in 6th National Roll Ball Championship held at Lakshmi Narayan Rathi Ground, Pune. Maharashtra Skating Association selects Rohit for ‘International Roll Ball Championship’. Rohit Bajaj wins 2 Gold medals in Junior National Roll Ball Championship. Junior Boys’ Roller Hockey Team fetches 1st Prize and Gold medal each at 6th Bhawan Hawk Roller Skating Carnival. Rohit Bajaj fetches 1st Prize each at Rink Race I and Rink Race II. Rohit Bajaj brings laurels by bagging gold medal for the country in Bangladesh India Roll Ball International Meet. Honored with a Gold medal and Certificate by the august hands of Padamshree Shri G.P. 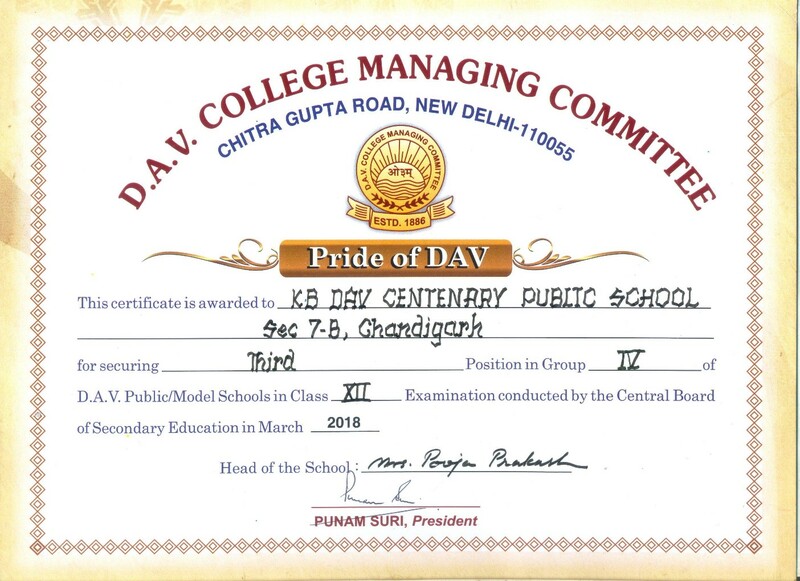 Chopra Ji, President, DAV College Managing Committee, New Delhi. Rohit Bajaj bags 1 Silver in Rink Race-I (Quad). School Roller Hockey team secures 2nd position and a Silver medal. The International Skater of school, Bhavdeep Singh Sachdeva received a Prestigious National Child Award for his exceptional achievement in the field of skating for the year 2009. The National Child Award carried a cash prize of Rs. 10,000/- a Silver Medal, a Certificate and a Citation. The award was conferred on him by Smt. Krishna Tirath, Hon’ble Minister of State for Women and Child Development on 14th November 2009 at Vigyan Bhawan, New Delhi. A student of Class X, Bhavdeep Singh Sachdeva is brilliant in studies and received a State Honor by UT Administration on Independence Day 2009 by His Excellency Gen. S.F. Rodrigues. He has to his credit 37 Gold, 22 Silver, 9 Bronze medals. In September 2009, he was away to Italy to participate in 4th Junior Boys World Roller Hockey Championship held at Bassano Del Grappa, Italy from 26th September 2009 to 3rd October 2009. Bhavdeep Singh wins 1 Gold Medal in Rink Race-II Quad and 1 Silver Medal in Road Race Quad. 700 Skaters from different states of India participate in 54th National School Games 2008-09 (Speed, Artistic and Roller Hockey event). Bhavdeep wins 1 Gold medal in Rink Race-II (Quad), School Roller Hockey team secures 2nd position and a Silver medal. Principal Madhu Bahl leads Indian Junior Boys Roller Hockey Skating Team as a Chief-De-Mission for 4th Junior Boys World Roller Hockey Championship at Italy from 26th September, 2009 to 3rd October, 2009. School skaters Bhavdeep Singh, Piyush Mittal, Karan Lamba, Mukul Jain and Vipin Kumar represent their country. Bhavdeep Singh Sachdeva becomes the proud recipient of National Award carrying a cash prize of Rs.10,000/-, 1 Silver medal, Certificate and Citation conferred on him by Smt. Krishna Tirath, Hon’ble Minister of State for Women and Child Development at Vigyan Bhawan, New Delhi. Bhavdeep Singh wins 1 Silver Medal in Rink Race-I Quad and 1 Silver Medal in Rink Race-II Quad. The school hosts the 47th National Roller Hockey and Inline Hockey Championship organized by Roller Skating Federation of India. Bhavdeep Singh clinches the Silver Medal in the Junior Boys category. Rink Races and Road Races see State Champions contesting for medals in the Under-8, 10, 12, 14, 16 & 19 years categories. National Skaters of school Bhavdeep Singh, Harsh Beniwal, Darshwinder Kaur, Tamanna Mann, Mohit Kumar and Mohit Thakur win a tally of 4 Gold, 4 Silver and 2 Bronze medals. The Roller Hockey Team Under-19 picks up the Silver medal. Budding school skater, Bhavdeep Singh wins 1 Gold and 1 Silver in Rink Race-I, II, Road Race in Under-19 categories respectively. 4 Medals are won by the National Skaters of the School in the 8th CBSE National Roller Skating Championship 2009.Karan Lamba wins 1 Silver Medal in Rink Race-1 Quad and 1 Bronze Medal in Road Race Quad. August 29, 2008 Chandigarh Administration honors National Skaters, Jyoti Rana, Karan Lamba and Vipin Kumar at 53rd School National Award Ceremony. The school hosts the 47th National Roller Hockey and Inline Hockey Championship organized by Roller Skating Federation of India. Mukul Jain, Karan Lamba, Vipin Kumar clinch the Silver Medal in the Junior Boys category. School Skater Karan Lamba shines in the 48th Chandigarh State Speed Skating Championship 2009-10, organized by Chandigarh Roller Skating Association in collaboration with KBDAV-7. The school’s Junior Team clinches the Gold Medal, while the Sub-Junior School team is placed at 3rd Position. Chandigarh Administration honours National Skater Vipin Kumar at 53rd School National Award Ceremony. The award was given by Sh. S.K. Setia, DPI(S). Vipin Kumar bags 1 Bronze medal in Rink Race-I (Quad). School Skater Vipin Kumar shines in the 48th Chandigarh State Speed Skating Championship 2009-10, organized by Chandigarh Roller Skating Association in collaboration with KBDAV-7. The school hosts the 47th National Roller Hockey and Inline Hockey Championship organized by Roller Skating Federation of India. Vipin Kumar clinches the Silver Medal in the Junior Boys category. The school hosts the 47th National Roller Hockey and Inline Hockey Championship organized by Roller Skating Federation of India. Mukul Jain clinches the Silver Medal in the Junior Boys category. Our National Skaters The Golden Girl!! From 1997 to 2004, Mehak Paul had amassed an amazing tally of medals. This record breaking feat included 54 Gold, 17 Silver and 3 Bronze medals. On 14th November 2004, Mehak Paul received the prestigious National Child Award for Exceptional Achievements 2002 in the field of Roller Skating. Mehak Paul declared as over-all champion in 2nd All India Dikshant Roller Skating Championship. School skating team bagged 10 Gold Medals. National Skaters, Mehak Paul is interviewed by Doordarshan, Chandigarh. She receives the rare honour to represent her school on national television. 10 Medals won by the National Skaters of the School in the Championship. Mehak Paul wins 1 Gold Medal in Road Race Quad, 1 Silver Medal in Rink Race-I Quad and 1 Bronze Medal in Rink Race-II Quad. Manjeet Singh wins 1 Bronze Medal in Rink Race-II Quad and 1 Bronze Medal in Road Race Quad. National Skater Manjeet Singh is interviewed by Doordarshan, Chandigarh and his interview is aired on national television.